Browse: Home / 2013 / November / This Is It. 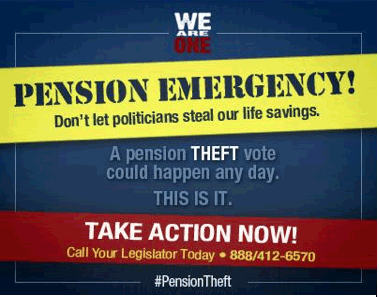 After years of unrelenting attacks on our retirement security, lawmakers will likely meet in Springfield on December 3 to vote on a pension-gutting megabill. You’ve heard these warnings before, but this threat has never been more real. Tell your legislators to vote “NO” on any legislation opposed by the union, and that you’ll be paying attention to their choice.